MB Series Heads offer optimum performance while remaining light weight and small enough to fit in the pouch of an average gig bag. 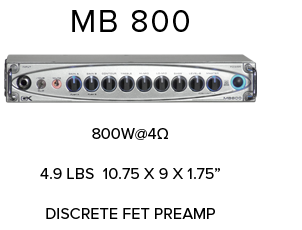 All heads feature aluminum enclosures, digital power supplies and power amplifiers as well as unique signal management circuitry, allowing them to deliver high volume while retaining punch and dynamics. Available models range from 200 watts to 800 watts and are available with a variety of solid state, all tube and discrete F.E.T. preamps.